LEWISVILLE, Texas, Sept. 6, 2018 – The leaders of the Soul City Church on Chicago’s west side sought help with plans for expansion to meet the needs of a growing congregation. The project evolved into a 29,000 square foot addition and 20,000 square foot renovation of the existing building, complete with insulated metal panels from Metl-Span. Insulated metal panel systems offer a wide array of profile, texture and reveal configurations. The product provides high-performance thermal efficiency and moisture control, while a factory foamed-in-place insulating core minimizes insulation gaps. Just more than 18,000 square feet of Metl-Span’s CF 7.2 Insul-Rib was installed on the Soul City Church. The panels contained a 4-inch urethane insulating core. The exterior was the Insul-Rib panel in Slate Gray PVDF and the interior was a Light Mesa finish in an Igloo White polyester. Working in tight quarters created some logistical challenges for T.A. Bowman Constructors LLC of Chicago. Safely installing insulated metal panels measuring 40 feet long and 3 feet wide required some planning and the enlistment of special equipment. 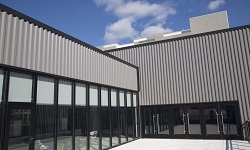 Because insulated metal panels are a single-component product, installation requires only one pass from the crew, minimizing labor time and costs. Bowman says this install required a crane to move panels into place and manlifts to move installers up and down the building, but it was done in less time than would have been required with other products. T.A. Bowman Constructors supplied the steel framing, steel erection as well as the engineering on the project. 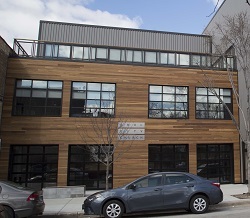 Focus Construction of Chicago was the general contractor.